I took a little blogging break that turned into almost a month. I didn't intend for that to happen, but sometimes you just run out of ideas and time to post. I finally became inspired just a bit and wanted to share some of my thrifty farmhouse finds with you. I've combined some of recent finds together to create this farmhouse vignette on my kitchen counter. My grandparent's kept their country kitchen neat as a pin with minimal decor, but always managed to keep it farmhouse cozy with personal touches. I try and create a feeling or special memory with my vignettes, so I also added lavender. My first find was the canning jar rack. I can think of so many uses for this rack, especially when I added the round metal tray. I was hoping my metal rack would fit in the tray and it did. Simple little things like this make thrifting worthwhile. You could use the rack and tray with mason jars of course, condiments for a picnic, add ice for beverages and so on. 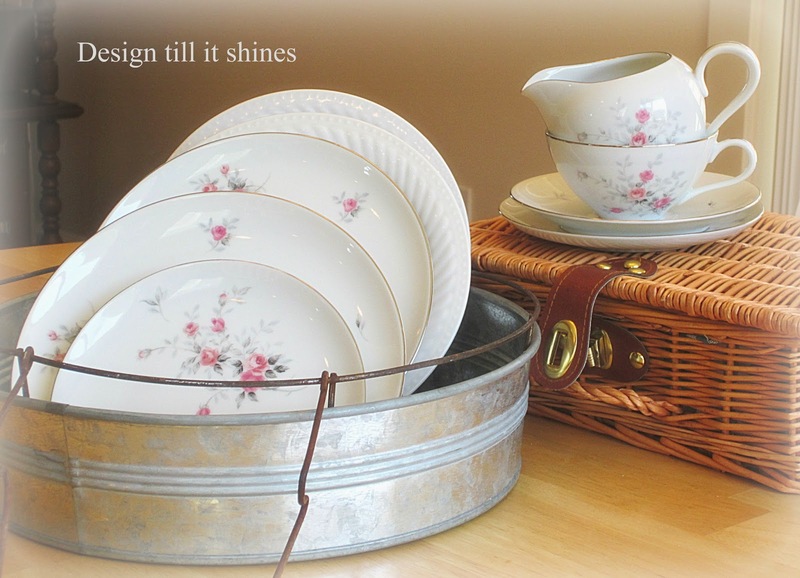 The simple rose floral dishes are from my favorite thrift store. 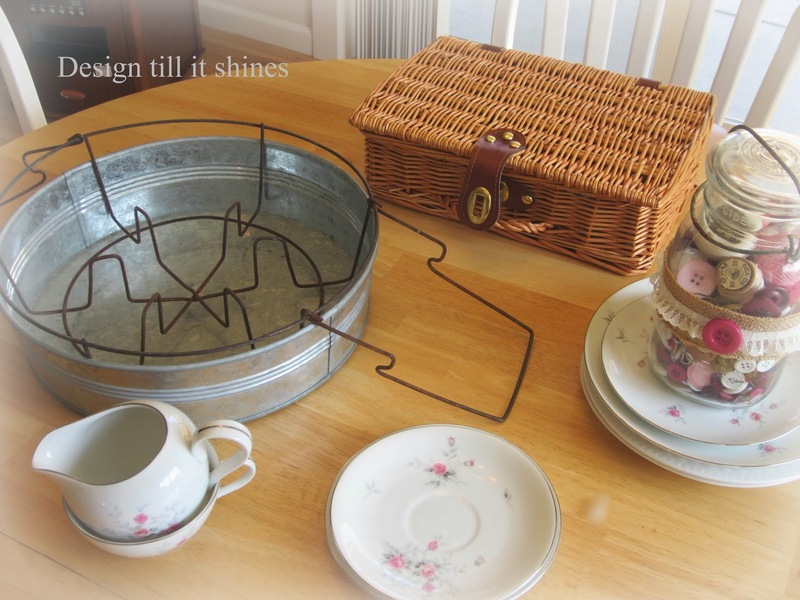 I found the round metal tray and the small picnic basket at a gift shop that was going out of business. Neither one of these items were marked for sale, but I went to the cashier and they said make me an offer and I got both for ten dollars. I've learned when a store is going out of business make an offer, even if the item is unmarked, and you might find a real bargain! 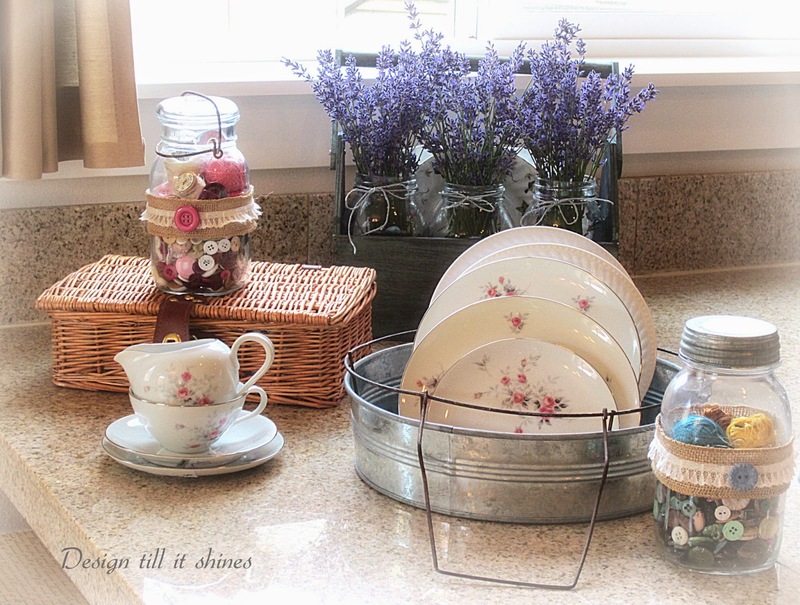 Mason jars will never go out of style for me because they are so typically farmhouse, especially filled with buttons. 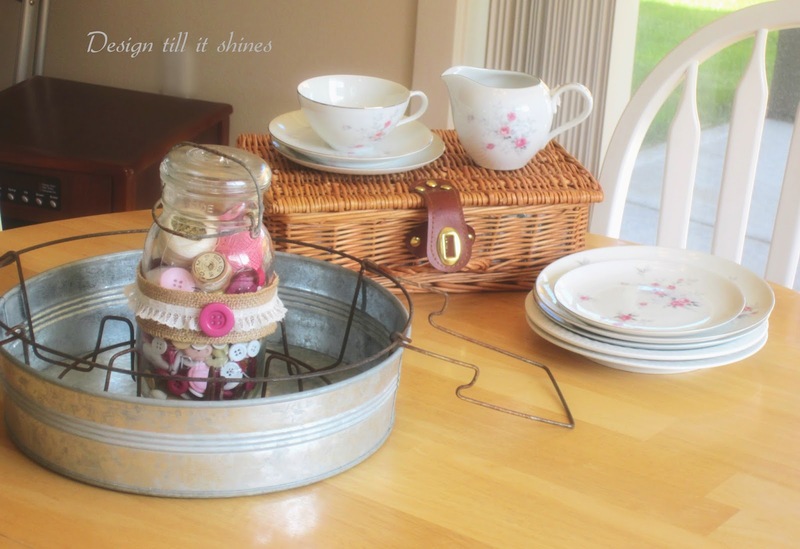 I added a variety of pink, plum and soft colors of buttons to this jar to match the lovely pink rose design on my dishes. It takes a lot of buttons to fill up jars, so I added some vintage thread spools to fill it up a bit more. 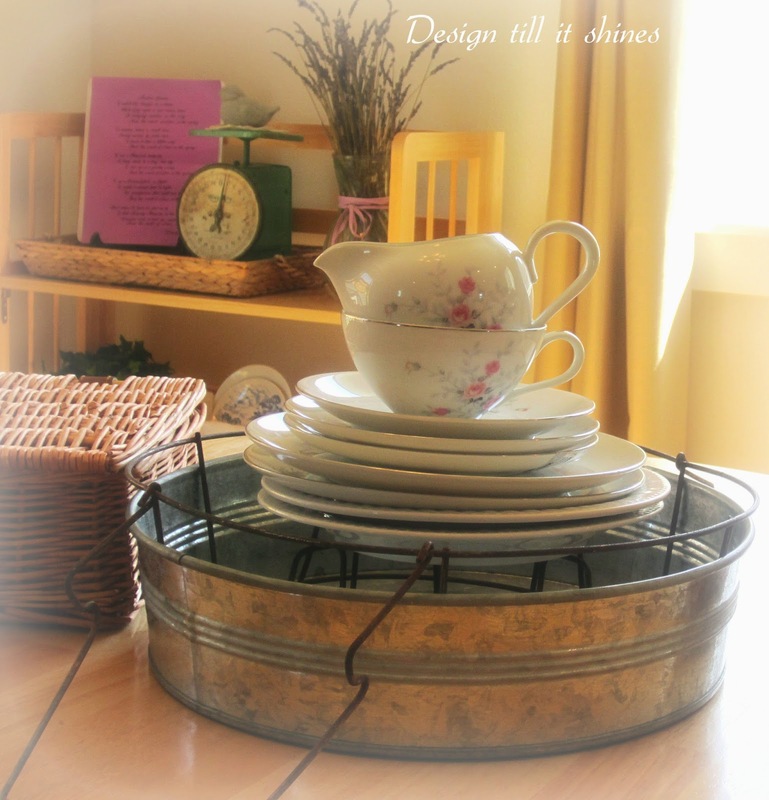 To add some interest to my canning jar rack, I stacked some plates on it for a vintage look. Although I love the plates stacked on top of each other, I love the idea of stacking the plates upright more. I wasn't sure if this way would work, but by using small salad plates I didn't need anything to prop them up with. I have some family heirloom dishes packed away in our tiny crawl space, but I discovered I really love this sweet china that I found. Along with the pink roses, there are small leaves in silver that match the round metal tray. Now I want more of these dishes, so I hope they have a few more when I go back to the thrift store. What's summertime without lavender? I picked some up when I stopped by the farmer's market and added it to my mason jars in my toolbox. I already had the metal numbers, so I added those to my jars which makes it a bit more whimsical. Love the lavender with the bluish green toolbox that was a clearance find at Joann's. Another mason jar with buttons in darker colors. I didn't have enough buttons to fill up all three jars, so I added some burlap and lace. Lighter summery colored buttons fill my 3rd mason jar. Lovin' the deep purple of the lavender. 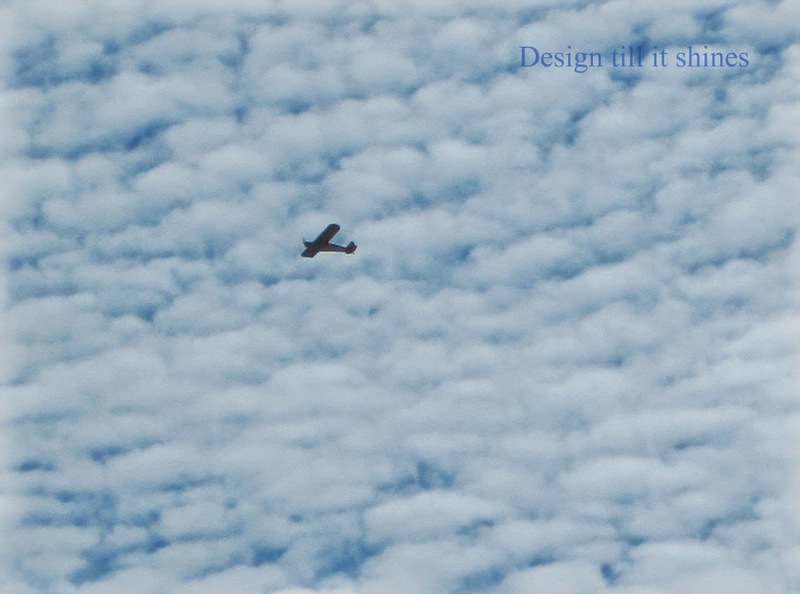 I looked outside when I was taking these pics Monday morning and spotted this vintage plane flying by. I grabbed my camera and took a few quick pics. 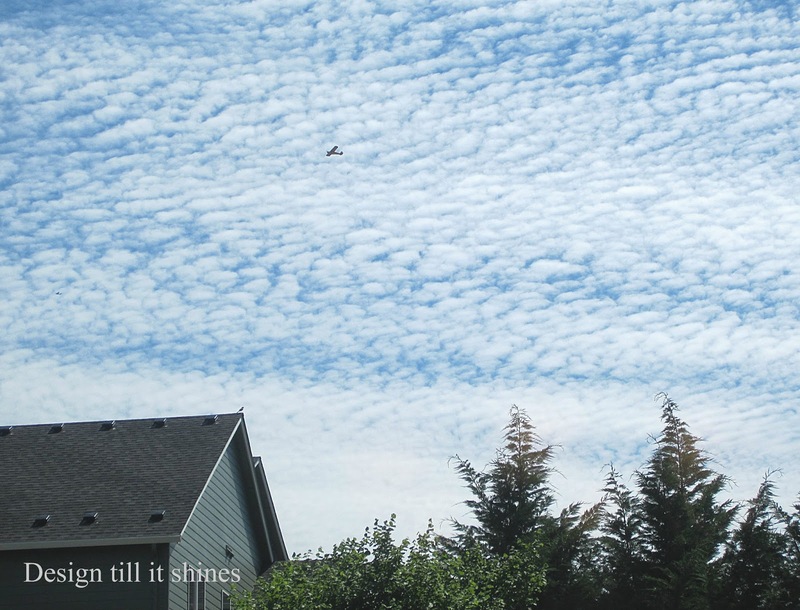 I just have a little point and shoot so the detail isn't as good as it could be, but I love the fluffy cotton ball look of the sky. We have an historic airport, built in the 1920's that is still in operation today. Every once in awhile we will see these vintage planes cruising along. The plane looks like a dark silhouette against the fluffy clouds in this pic. This photo was taken later in the day and shows the corner of our dining area. 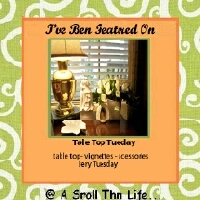 Some of my decorating ideas came from our Victorian house tour back in May. If you missed the tour visit here. I'll be sharing my kitchen tour next and you'll see just how tiny a kitchen can be and still be functional. Thanks for visiting! Good Morning Diane, I love owning something which has been used and loved by a previous owner. Do you know, I very rarely buy from large shops anymore because I can always find just what I want at either a charity shop or a car boot sale. 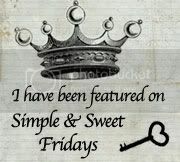 You have found some lovely items and I love how you have stored your buttons. 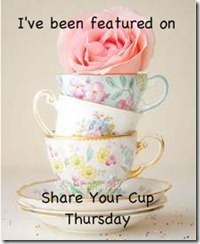 The delicate pink roses on your china are gorgeous.... they are my favourite flower. You created a lovely vignette for us to enjoy. 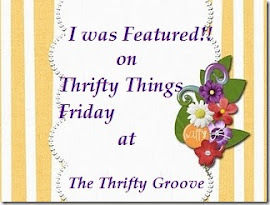 Diane - these are some great finds...I love old dishes, but have had to let some of mine go lately as we sold our current home and are downsizing...congrats on your great finds! 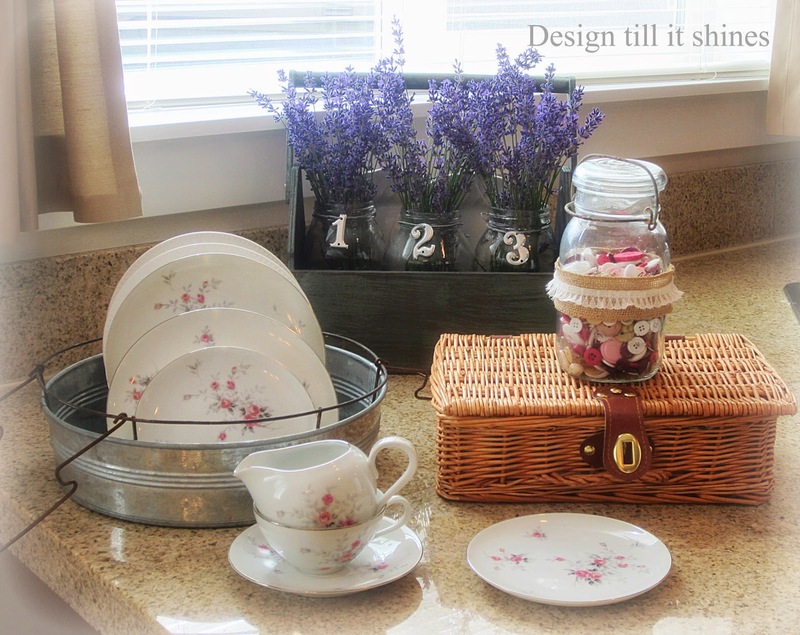 Love the farmhouse vignette on your kitchen counter...so pretty!! You found some great finds! Great photo of the vintage plane. 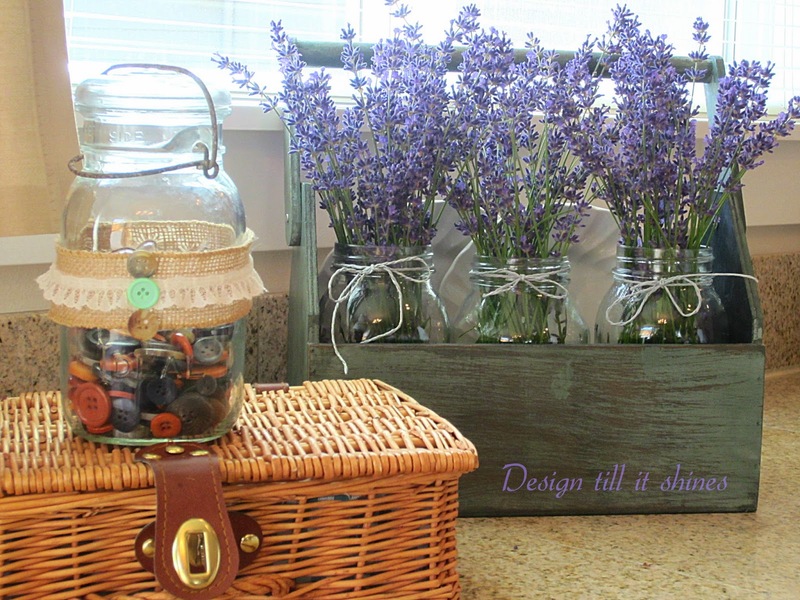 I adore lavender -- it's at its peak right now so I'm always looking for ways to display it and use it. Your vignette is lovely! Hi Diane, Your vignette is lovely. The way you displayed your dishes reminds me of my grandmother - after she washed dishes she would stack them on their side in a similar looking rack (I never knew what it actually was) and pour simmering water over them. Your dishes are so pretty! Isn't it nice to find something you just enjoy? I don't know if you get enough sun and drainage for lavender? I have good luck with it - Any spot that is to hot for sandy for anything else - in goes a lavender plant! Such neat finds! I love the way you pulled them all together to make the gorgeous vignette. Lovely! Welcome back Diane. Beautiful farmhouse vignette! I have a canning rack like that and would love to find something similar to hold it. Love how you used it for displaying the plates. Thanks so much for sharing with SYC. 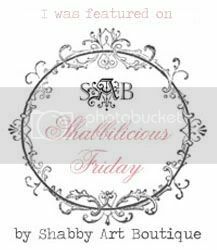 What a beautiful vignette your created. 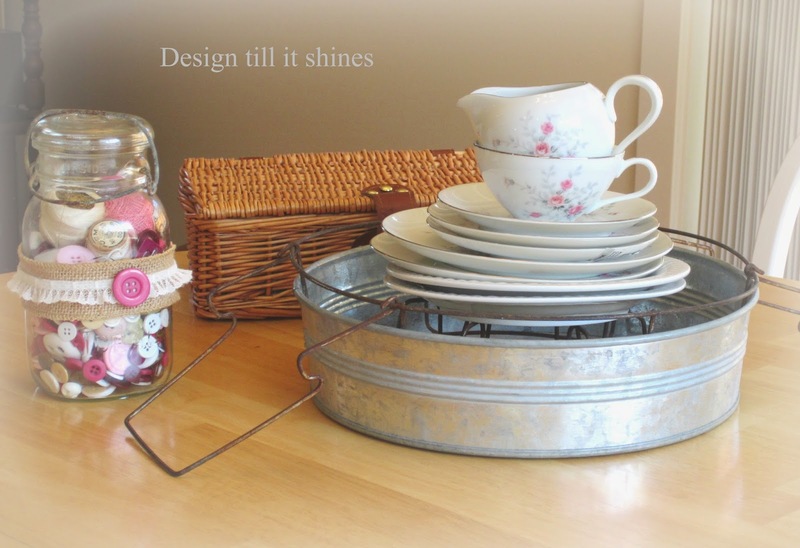 Love all your pretty finds especially the canning jar rack inside the metal tray. 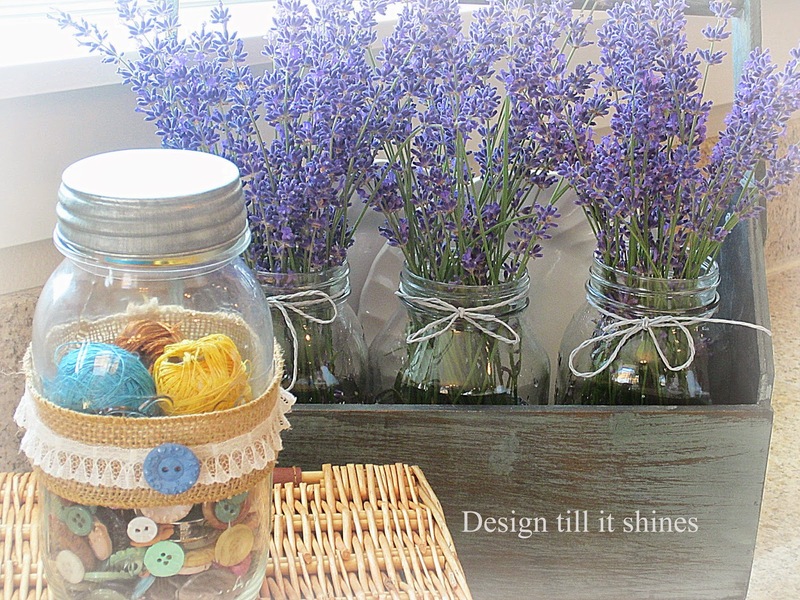 Your mason jars are so pretty with the lavender and cute number tags. Hi Diane, you found some charming farmhouse treasures. Love the vignette you created and the mason chairs are perfect. I have my mother's vintage canning jar rack and love it. Welcome back! Well, you certainly inspired US with your newly found treasures, which are all adorable! 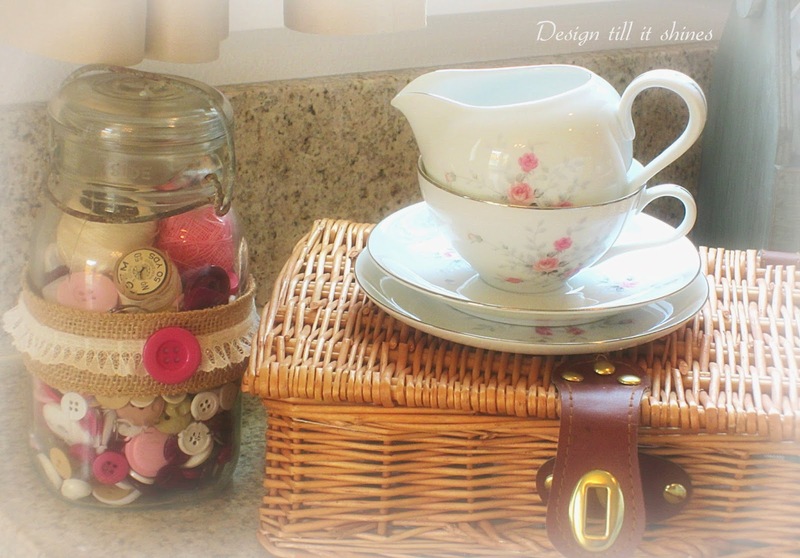 I love the lace on the burlap around the glass jar of buttons - buttons are so cute! You managed to capture the most dreamy sky I've ever seen, I think! Wow! I, too, use a point-and shoot; mine's a Sony Cybershot, and I am very happy with it, with the exception of food photography, which it doesn't do all that well...or it's just me? !